Today the minnies are participating in a Memorial Day parade. They're so excited to wear their red, white, and blue as they celebrate this special holiday. As a child, I decorated my bicycle with crepe paper and other patriotic decorations for the parade. It was something that I anticipated for weeks. It's so nice to see that so many towns still celebrate Memorial Day with parades. Does your town have a Memorial Day parade? 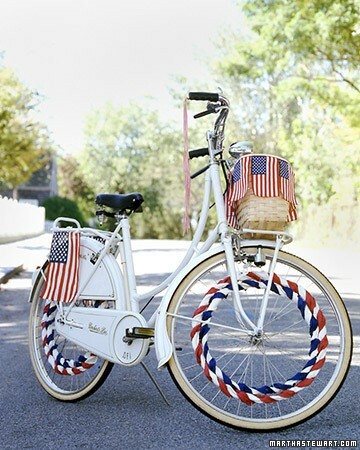 I love that bike -I'ld never want to take the decorations off! Have a lovely parade - no our town does not - but we'll be at a ceremony tomorrow. I've always wanted to participate in a Memorial Day parade - I hope the minnies have fun! Happy Memorial Day! How patriotic! Know they had fun!